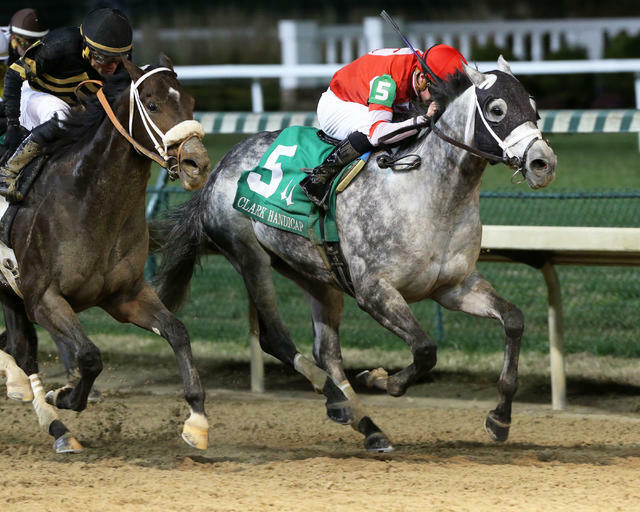 Fayette Stakes (Grade II) winner Leofric turned back a determined challenge by 3-year-old Bravazo in deep stretch to win a thrilling renewal of Friday’s 144th running of the $500,000 Clark Handicap Presented by Norton Healthcare (Grade I) by a neck. Defending Clark Handicap champion Seeking the Soul, the 123-pound starting high weight and 3-2 favorite, was another 2 ¾ lengths back in third. Owned by Steve Landers Racing LLC, 5-year-old Leofric covered 1 1/8 miles on a fast track in 1:48.59 while toting 121 pounds and jockey Florent Geroux, who rode the winner for trainer Brad Cox. The lofty $300,700 first prize lifted the gray or roan Kentucky-bred’s earnings to near-millionaire status: $951,040 from a record of 8-1-3 in 14 starts. Southern California-invader Prime Attraction, who was second to Leofric in the $200,000 Fayette at Keeneland on Oct. 27, set the pace in the field of eight 3-year-olds and up through fractions of :23.56, :47.58 and 1:11.61. Breaking from post No. 5, Leofric and Geroux worked out an ideal trip along the inside rail and rated just behind longshots Sightforsoreeyes and Storm Advisory, who chased Prime Attraction into the far turn. Bravazo and Seeking the Soul, who finished third and second in the Nov. 3 Breeders’ Cup Dirt Mile (GI), were positioned just behind Leofric. Midway around the turn, Leofric drew even with Prime Attraction and inched clear at the top of the stretch with Bravazo a half-length back on his right hip. The two matched strides in a long stretch drive with the elder getting the best of the 3-year-old in the final stages. Leofric rewarded his backers with mutuels of $8.60, $4.40 and $2.40 as the 3-1 third betting choice. Bravazo, at 118 pounds, returned $3.80 and $2.40 as the 2-1 second choice. Seeking the Soul, under John Velazquez, paid $2.10 to show. Prime Attraction faded to fourth and was followed by the distant foursome of Hence, Hawaakom, Storm Advisory and Sightforsoreeyes. This was the first Grade I win and third graded stakes victory of the year for Leofric. In addition to winning the Fayette, he scored in the $200,000 West Virginia Governor’s Stakes (GIII) at Mountaineer in August. After the latter, Leofric finished third behind Yoshida (JPN) and Gunnevera in the $750,000 Woodward (GI) at Saratoga. Leofric is son of Candy Ride (ARG) out of the Unbridled’s Song mare Lady Godiva and was bred by Peter E. Blum Thoroughbreds. Racing resumes Saturday at Churchill Downs with a 12-race program that begins at 1 p.m. (all times Eastern). The 92nd running of the $200,000 Kentucky Jockey Club (GII) – a “Prep Season” race on the Road to the Kentucky Derby – and the 75th running of the $200,000 Golden Rod (GII) for fillies are the headliners on the second-to-last day of Churchill Downs’ 21-date Fall Meet. Billed as “Stars of Tomorrow II,” each of the 12 races is exclusively for 2-year-olds that may have aspirations of trail-blazing their way to next spring’s Kentucky Derby Presented by Woodford Reserve and Longines Kentucky Oaks. There is a massive $317,738 carryover in the 20-cent Single 6 Jackpot to chase on Races 7-12 after Kentucky Horse Racing Commission stewards had a double disqualification in Friday’s finale. If the result stood with Presidential Tweet crossing the wire first, the full jackpot would have been paid. Instead both President Tweet and runner-up New Colossus were disqualified for interference in deep stretch and third-place finisher Laser Loop was promoted to first, which triggered the massive full carryover. If the jackpot is not hit by a single winning combination on Saturday, there would be an enormous mandatory payout on Sunday’s 12-race finale. Also, there is a $49,200 carryover in Saturday’s late Pick 5 on Races 8-12 because Friday’s middle Pick 5 was not hit.